It is years since the establishment of Moben Global Inc., who pushed out FOSJOAS electric self-balancing scooter. Up to now, it has unveiled a host of electric self-balancing scooter of all description. In the current market, FOSJOAS electric unicycle, twin-wheeled intelligent scooter and two-wheeled self-balancing abound. The electric scooter of different models has different features and performance. For the players, the single-wheeled intelligent scooter is noted for its agility, the twin-wheeled self-balancing scooter acts as a transition from single- and two-wheeled scooter. The latest and most advanced model like V9 and U1. 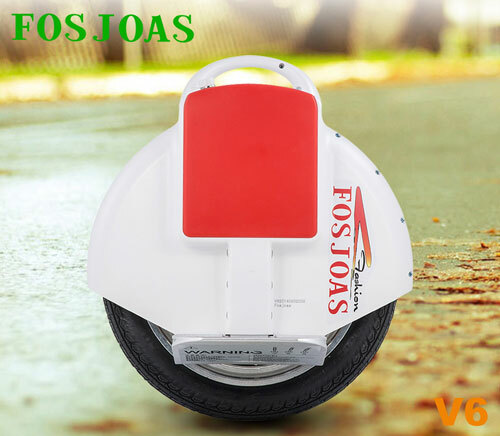 Through the assessment on the part of numerous players who are fond of intelligent self-balancing scooters, they agree on that FOSJOAS electric unicycle V6 is proper and right to be hailed as the classic model that need the hitch concerning technique. The common players is far from steering it. He who can expertly control V6 is touted as the highly skilled players. This honourable title is priceless. Anyone who aspires to secure this title has to conquer V6. It is a must for him to become a veteran players. FOSJOAS V6 runs nimbly and agilely. If lacking of long-term practice, a beginner can hardly steer it. Those players who evaluate it added that especially on a bend, the turning requires a fairly adept skill. For many tyro players, FOSJOAS two wheel electric scooter like V9, U1 U3 and K3 are easy to ride. As long as one stands onto any one of them, he can steer it at once. However, some veteran players warn these tyro players that although FOSJOAS two-wheeled intelligent scooter is fairly suitable for beginners, it still requires a certain practice. Especially at critical time when at sudden brake, the rider might fall over because of failure to brake caused by lacking of practice. At critical time, there is left extreme time to consider and brake. Therefore, veteran players advise those players to enhance their skill in case of critical point. © 2016 fosjoas.com Moben International (U.K) Co.,Ltd.